Well it's true what they say isn't it? You Only Live Once, so you may as well enjoy yourself! 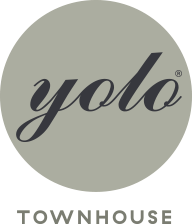 With that in mind, welcome to Yolo Townhouse – a social experience for Newcastle City Centre. A Bar, Eatery and Roof Terrace spread over 3 floors on Newcastle’s historic High Bridge Street (just off Grey Street). Great cocktails, fantastic wines, prosecco, champagnes and a quality cold pint is our bread and butter. We serve our fantastic food menu from noon daily with breakfast available from 11am Mon-Fri and from 9am at the weekend. We’re offer a warm, relaxing space to enjoy unlimited filtered coffee with all our breakfast items. Fancy a bite to eat? Whether it’s a sharing dish, a light bite or one of our deliciously fresh new kebabs, we cater for all tastes. Want to treat the kids or simply don't fancy cooking? Solution... We have just introduced a brand new kids menu. Your child can become a chef for the day and "build their own pizza" for their tea whilst sporting their own chef’s hat! We also know how to throw a party, so why not let us arrange that perfect event whatever the occasion, day or night. You can choose between our cosy booths, our best seats in the house or how about booking an entire floor? The 'Parlour' on the middle floor at Yolo Townhouse has a capacity of up to 120, its own bar and plenty of luxurious seating. It also features our 'Snug' which is perfect for groups of up to 15 people for food or drinks. You can also take advantage of those milder nights by booking our outside roof top terrace complete with inside bar. Our intimate heated outdoor space with retractable canopy creates an ideal space come rain or shine. You decide which package you want from the information found in our function pack and we will do the rest. It’s as easy as that! Why not come down and give us a try? After all, You Only Live Once. We are open Monday-Thursday 11am-midnight, Friday 11am - 2am, Saturday 9am-2am and Sunday 9am-midnight.